M Jackson joins our Women Working in Nature and the Arts series. She is an adventurer and environmental educator pursing a doctorate in geography and earth science at the University of Oregon, where she is researching glaciers and climate change in the Arctic. M, a National Geographic Expert, has received over 20 national awards and honors for academic and creative work. While Glaciers Slept is M’s debut book, with a foreword by Bill McKibben. It is bold and sheer while also being soft and silent. Photo by M Jackson (left), alongside Peter Richards and Mike Diaz during a National Geographic Student Expedition. Mary: Hi, M. Thanks for squeezing in this interview between leading Arctic trips for National Geographic Student Expeditions and your other work. Your new nonfiction book, While Glaciers Slept (published August 21, 2015 by Green Writer’s Press), compares the losses of life from climate change to the harsh grief you experienced when your parents died. This is one of my favorite books this year–inspiring on so many levels. I could relate intimately, as my father died around the time I began to focus on climate change in literature. “Unimaginable,” the word you use in your book to describe death, is perfect for chronicling the loss that we intellectually understand but, in reality, is so hard to deal with when it actually happens. When writing this book, how hard was it to refocus on your parents’ death? M Jackson: I initially imagined this book as a series of discrete essays. As I wrote, I focused on just one or two aspects of my parents’ lives, and of their deaths. For me, at that time, it was manageable. However, what I was unprepared for was the editing process—the going back. I’d written the book, but it took awhile for it to be picked up by a publishing house. Going back through the pages, re-living some of those harder moments—at times it was extremely difficult and I could only do it in increments. I’d edit a page or two, then take a break for the rest of the day. My mind would start to crowd with thoughts of doubt, with wishes of doing things differently, of overwhelmingly missing these two people. I had to do it slowly, intentionally. Mary: You liken glaciers to people. Your words make glaciers alive, ever-changing—which they are. What made you decide to study glaciers? M Jackson: Glaciers struck a chord in me. For a long time they were those things up there on those mountains. But exploring my first glacier, listening to the ice, seeing the hourly changes, the perceptible breathing in and out of the ice, the roar of the water coursing through just under the surface—it started to make sense to me in a way that is unfortunately hard to explain. It was like sitting in a room with old friends. I was comfortable with ice and completely happy. Mary: You lead glacial student expeditions for National Geographic. In your work you see first-hand retreating and melting glaciers. What are some of the most heart-rendering experiences you’ve had? 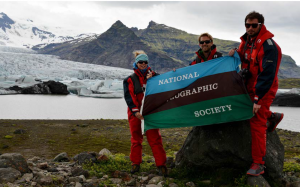 M Jackson: Just this last month I was with National Geographic Student Expeditions in Iceland, and we were out on the Svinafellsjokull glacier. Mind you, this is a glacier I’ve been visiting every year for the last six years. While we were out on the ice, we rappelled down into an enormous dry moulin. Moulins are the tubes and tunnels carved by water that run through a glacier. The one we were in—the first one I’ve ever accessed on this glacier—didn’t have water flowing through it. Essentially, then, we were in this enormous tunnel in the ice, and everything surrounding us was dripping dripping dripping. The light was a stunning milky blue, and the experience was incredibly visceral. What struck me, and I still carry with me, is how something so beautiful like that was available in large part due to the glacier’s rapid change. Svinafellsjokull has receded and deflated significantly over recent years, and standing in this freshly exposed moulin—which was perhaps ten, fifteen feet wide, illustrated the rate of change happening to the ice. Mary: Amazing! Early in your book you describe leading some students up to the Thorofare Ridge in Alaska, which is in the Denali National Park and Reserve. Once up there, you began running, and your students began running. Your words were, “In all my years of being out here, I still find incomparable the rejuvenation I feel running on tundra.” You even saw a herd of caribou. I can’t imagine this freedom and thrill, yet it must be juxtaposed by the fact that the world you were rejoicing is under such threat. How does this make you feel? M Jackson: The freedom and thrill, which is tinged by the increasing knowledge that the specific places I love the most are shrinking and melting, is an ever-present part of my work. Just like being out on Svinafellsjokull last month—these places are changing. But importantly, glaciers are not all gone. Often we narrate glaciers as if they are ruins of a different time, features of a landscape that no longer exists. Glaciers are very much real, very much still present on this planet. Glaciers are worth advocating for, worth standing up and saying—the way we live today cannot continue. A world without glaciers is not a world I’m interested seeing to fruition. We have so much work to do to make a different future, and I think the energy is building to make it possible! Mary: I completely agree. There is one scene in the book where your mother has died and you had returned to graduate school immediately after. You reminisce on this a year later you when connecting with your soul sister Shauna. You are good friends and you want to talk about your mother’s death, but you stay silent, not sure how to bring up what you are feeling. You begin to drift into memory of how it was that year. The memory is transient and drifting, like ice. It is not solid. It shifts and finds itself formless. I found that very interesting to read and just wanted to thank you for such a beautiful description of that time. Do you have any more thoughts on those moments that you would want to share? M Jackson: Memory is such a funny creature, Mary. There are times when such moments are truly substantial. I can remember the taste of the air, the smell of glacial ice. Then there are times when all that remains are faces that blur past. I tried to write that section as I experienced it—which means it was at times razor specific and other vague and abstract. As a writer, this is one of the places where I struggled quite a bit. Mary: Well, you pulled it off beautifully. When discussing the car accident that resulted in your mother losing her right leg, you wrote that the planet is disabled. What prosthetic is available, and what are your thoughts on geoengineering? M Jackson: I am an optimist at my core. I have faith not only in people’s better selves, but also in our adaptive and responsive capacities. We can change. Geoengineering might not be the best way forward, especially at a planetary level, as it does not address the core inequities that have given rise to the climatic changes we are experiencing at present. However, the innovative sciences behind geoengineering point towards interesting applications that might be appropriate at local scales, and the associated concepts, strategies, and technologies could be a gold mine for ways forward into a future that will have to adapt to widespread climatic changes. Mary: Your descriptions of Alaska remind me of British Columbia, where I live—where resource extraction remains high, despite great opposition. And this is very sad. Yet, your descriptions of the wilderness are ones filled with unbridled awe, silence, and respect. “The Place Where You Go to Listen” is a beautiful concept. John Luther Adams composed a sound-and-light installation with this title, referring to the Arctic, but the place is really imagined in myth. According to the New Yorker, “Naalagiagvik [is] a place on the coast of the Arctic Ocean where, according to legend, a spiritually attuned Inupiaq woman went to hear the voices of birds, whales, and unseen things around her.” Why is listening so important? M Jackson: One of my favorite things to do on a glacier is to park myself on a nice piece of ice and sit there in total silence for ten, fifteen minutes. I try to build this time in after a day of crunching around on crampons, climbing, walking, exploring, photographing—doing all those other things that require attention and care. 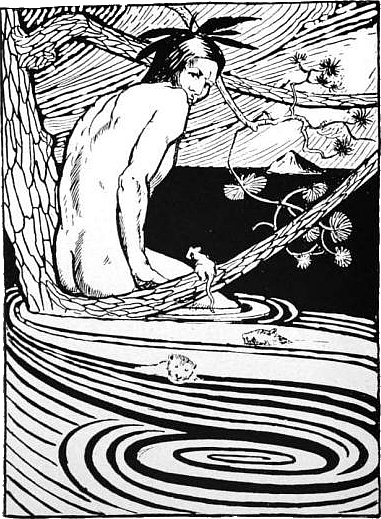 Sitting down and listening draws attention not to the sounds I am making; but rather, the symphony happening around me on the ice that I can only hear if I quiet down. It is in these quiet moments that the glacier reveals herself in entirely novel and original ways. There is so much in life that can be missed if we don’t settle down for a bit. My life is full of distractions—deadlines, flights to catch, a smartphone that beeps away, life life life. Listening brings things to focus, and often times it is quite surprising what draws the attention of that quiet ear. Mary: I get you on the distractions! Finding a place in the wilds to go listen to is important to me as well. Thank you so much for the interview, M. I will be watching your work; it has inspired me to get closer to glaciers where I live. The interview was fantastic. It was both personal (on both sides) and enlightening! I am sharing far and wide and I love that M is part of the series you have on Women Working with Nature & the Arts.My daughter had her third surgery yesterday and we are home from the hospital! She has a long road ahead, but M has inspired her—and now this interview will help reach more people to bring them that same kind of inspiration. Congrats! Thanks, Dede! Best wishes for your daughter’s recovery!